Janssen Pharmaceutical wanted invites, posters and exhibition artwork for their Medical Education symposium at the British HIV Association meeting in Birmingham. 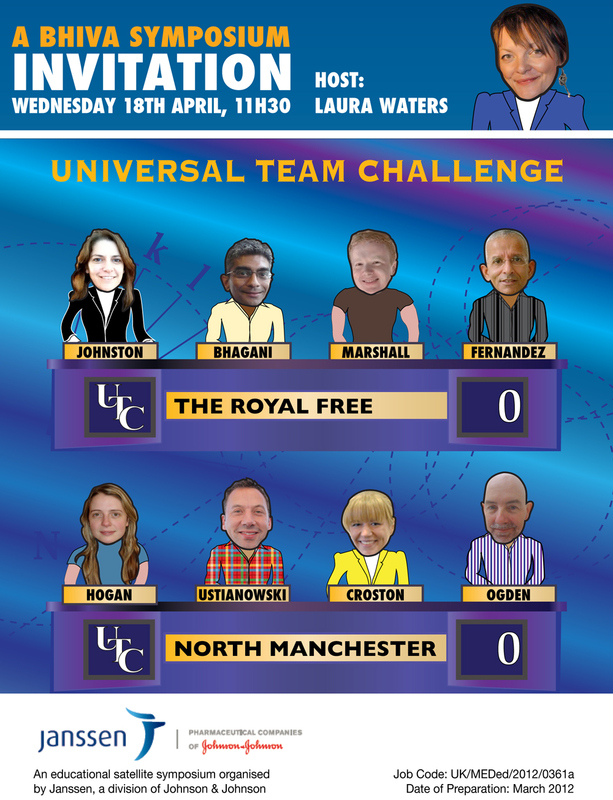 The symposium, Universal Team Challenge, was based on the theme of University Challenge. I created an illustrative University Challenge style ‘set’, to be used throughout. To maintain the marginal budget, and give an edgy feel to the branding, I chose an ‘obvious’ cut-out-and-place feel to the artwork with oversimplified characters and thick borders. I drew caricatures of each participant (well known consultants, pharmacists and nursing staff) and used headshots they had already supplied which were of varying quality. Close liaison with staff from Armadillo, Janssen Medical Education department and Janssen’s printers was established and maintained to create the range of artwork required (a pull-up banner, a poster, a lecturn panel and two ‘team’ panels). All artwork was completed on time, and on budget, to the complete satisfaction of both the client and the agency. Feedback to both agency and Janssen was extremely positive, with the artwork highlighted as professional and impactful. The symposium was attended by 750 healthcare professionals.